For some reasons, the United Nations and the international humanitarian community have been unable to exert pressure on the United States, Saudi Arabia and their junior partners to change course in the ongoing war of aggression against Yemen. 1- The Trump White House has made it clear that it wants to derail the 2015 nuclear deal in pursuit of a still a more belligerent approach towards Iran and its allies. Hence, they continue the Yemen war after allegations about (non-existent) Iranian threats. It’s even more disturbing to see war-party Washington endorse more weapons sales to Riyadh and build more illegal military bases in Syria that will only exacerbate the US-supported starvation of millions of civilians in Yemen, and prolong the devastating regime-change war in Syria. 2- Three years into the 2015 Saudi-led invasion, untold thousands are dead. Northern Yemen has been through the worst cholera outbreak in human history, and civilians continue to die in bunches from US-backed, Saudi airstrikes. Yemen is in a disastrous state, with a US-Saudi naval blockade threatening to starve millions. If there is one thing Yemen has no shortage of, however, it’s weapons, with the US ensuring a massive supply continues to pour into the hands of Saudi and Emirati forces. 3- Thanks to the unnecessary conflict, US arms sales are themselves at a record high, in no small part because of purchases by the UAE, and particularly by the Saudis, who are dropping US bombs on northern Yemen as fast as they can buy them. And while bombs and warplanes are the big dollar amount of sales, they also include large numbers of US-made automatic rifles and small arms ammunition. Saudi Arabia and the UAE buy these small arms, both for their own direct involvement in Yemen, and for arming their allied militant factions on the ground. 4- The US sends weaponry into Yemen that is not well-documented and carefully tracked. The Pentagon regime has confirmed they can’t account for the weapons that they give to the Saudis. The Saudi and UAE-bought small arms are not just being sent to Yemen either. Rather, they are also being sent to Syria to be in the hands of their allied militant factions on the ground. 5- Despite some diplomatic games at the US Congress, the conflict won’t end any time soon. 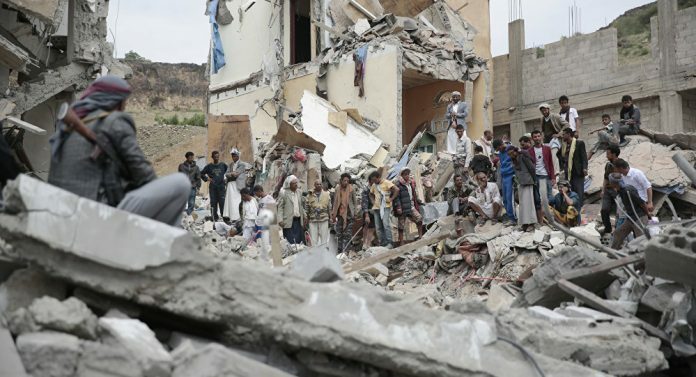 US arms sales are ensuring that the Saudi and coalition warplanes never run out of bombs to drop, despite those airstrikes accomplishing nothing but killing more and more civilians in the north. Report after report by the UN faults the Saudis for soaring civilian deaths, and particularly the deaths of children, saying that the efforts to prevent harm to civilians remain largely ineffective. The strikes continue to increase indiscriminately, and the Security Council is not doing anything about it. In a nutshell, US arms sales to Saudi Arabia are a major driving force in allowing them to continue the war. Saudis use US planes and bombs, and are refueled by the US Air Force during this criminal campaign. US culpability in this humanitarian disaster and war crimes should fuel growing concern at the UN. As much ink as has been spilled about the morass the Americans and the Saudis have stumbled into in Yemen, this war of aggression has nothing to do with trying to intensify efforts to counter Al-Qaeda in the Arabian Peninsula, much less by Saudi Arabia and the UAE to take seriously their fears about spreading Iranian influence in the region. The escalation of the conflict and the Iran bashing are only designed to increase US weapons sales and justify permanent US military presence in the Persian Gulf. That perfectly sums up the argument as to why no one in the Trump White House seems able to answer whether or not they want to distance themselves from a war that is causing so much human suffering. The US government, the Pentagon regime, and the Military-Industrial Complex are reaping the fruits of the three-year war. This should be more than enough for them to earn the enmity of the human-rights community and members of the UN concerned about growing civilian casualties.